The Whitney Museum makes a move. American art is dying and being reborn. The death is happening on 75th Street in New York City and the birth is happening downtown in the same city, in what’s known as the Meatpacking District. The Whitney Museum is breaking ground on a new building that will be located between the High Line and the Hudson River Park. The building is designed by starchitect Renzo Piano. It is going to be a large building, with terraces that descend toward the Hudson River and reach down to the level of the High Line, the elevated park built on the raised railroad tracks that once served the ports. The terraced structure will sit on a glass base that is accessible at street level. The three-step terracing of Piano’s design is a conscious reference to the Whitney Building up on 75th and Madison (the latest reports say that the old building will eventually be taken over by the Metropolitan Museum). The building on 75th Street was designed by Marcel Breuer, the great Hungarian Modernist architect of Bauhaus lineage Breuer is perhaps most famous for his Wassily Chair, its bent steel and strips of leather being definitive of Bauhaus Minimalism and the use of industrial materials. His Whitney building went up in 1966 and its reverse terracing and blocky, aggressively Modernist feel was an immediate cause for controversy. It was controversial because it is, for lack of a better term, ugly. Pointedly ugly, perhaps. Ugly to a purpose, maybe. But ugly none-the-less. It was once, famously and not by way of a compliment, referred to as “an inverted Babylonian ziggurat.” There is a reason that people started referring to Marcel Breuer and architects like him as designers in the Brutalist style. The Whitney building on 75th Street is brutal. It is mean and gray and boxy and looks like a place in which interrogations would be performed by members of a shadowy intelligence organization. The few pointy and unfriendly windows that grace its exterior exist, seemingly, to mock the idea that anyone would want windows. If you must have windows, Breuer is telling us, then, please, choke on these. They are not windows out of which to look so much as windows out of which to scream. Say what you like about Modernism in art, but those were two things it really could express: sincerity and profundity. It was a particular point of pride, moreover, that American visual art of the 20th century had learned to be sincere and profound. This possibility was not a foregone conclusion. The rest of the world, after all, has had ongoing and recurrent cause to doubt the American capacity for sincerity and profundity. But the great American painters and sculptors of the post-WWII era (from Jackson Pollock to Nam June Paik to Agnes Martin) found themselves undaunted by the doubts. 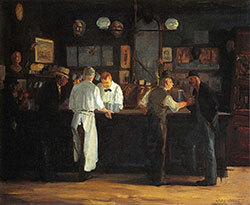 The Whitney, as the “preeminent institution devoted to the art of the United States” was there for them. 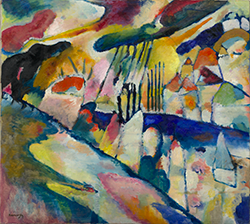 One of the great claims of Modernism, one of its non-negotiable tenets, was that beauty is not a desirable aesthetic goal if beauty is defined as “pleasing” or “pretty.” That kind of beauty was to be destroyed, and Modernists from Bauhaus to the Abstract Expressionists set out to destroy it. The beauty to be found in Modernism was going to be a harder beauty, a more exacting beauty, a beauty that challenged the viewer to redefine and to heighten their capacity for aesthetic experience. Modernist beauty was like a hammer of the absolute smashing down through the veil of appearances. That hammer could only be swung with an attitude of sincerity and profundity. There’s no other way. Marcel Breuer’s building on 75th Street was built with the hammer of the absolute. 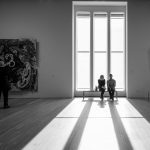 It is a beautiful thing, not because it catches the light nicely or has lovely galleries for the viewing of art or any other reason that has to do with pleasantness. It is an unpleasant building if that’s your approach. But it is true to an aesthetic. It is true to a vision of art that values sincerity and profundity in the way of the great Modernists. It repels all other values, denies them at the door, grinds them to bits. The vitality of the street is one thing, says the upside down Babylonian ziggurat, and the sincerity and profundity of art is quite another. 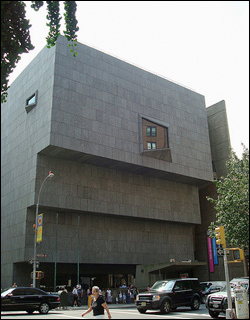 For all these reasons and more, it no longer makes sense for Marcel Breuer’s building to be the house of the Whitney. The aesthetic that Breuer once championed no longer holds sway. Modernism died a long time ago, and the art to be seen within the walls of the Whitney today seeks, more often than not, to cancel the distinction between itself and the vitality of the street outside. A new building is thus appropriate. A new location is called for. A new era needs a new vision. What is that vision? We aren’t sure. Were someone to step forward and claim that the values of contemporary art are sincerity and profundity, for instance, it would just sound strange and untimely. We don’t know what we want art to be and to do right now. We might as well be honest about that fact. We aren’t sure. Maybe we will never be sure again. Adam D. Weinberg, the Director of the Whitney Museum, said an interesting thing about the new building: “On this spectacular site adjacent to the High Line, and with Renzo Piano’s brilliant design, the new downtown Whitney will put us right where we want to be: poised to reshape the museum experience for the audiences of today and tomorrow.” Marcel Breuer’s building, you may remember, is not poised to do anything. It has already done it. Piano’s building, by contrast, will be defined by poise, the positioning for the possibility of an action that has yet to happen. Renzo Piano’s building, then, promises to be every bit as true to its moment as Marcel Breuer’s building. Modernism was coming to a definitive end at the time Breuer built his building, but it was still alive, it was still able to make strong claims. It may, in fact, be the case that the strongest feeling out there at the moment, in art as in life, is uncertainty. Piano’s building flips Breuer’s building upside down, turns the ominous ziggurat steps into terraces and makes the internal spaces lighter and more open. And why not? We might as well be able to breathe a little and enjoy the view. We might as well give the art a little more room to breathe, too. 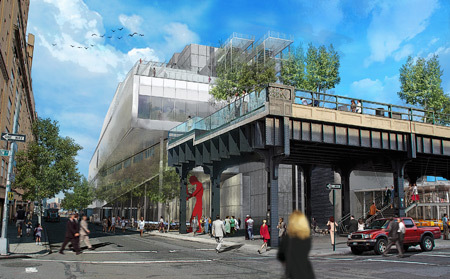 In a widely circulated computer mock-up of the new building, intended to give people a sense of what the finished product will look like, our viewpoint is largely obscured by trees and by the pre-existing metal structure of the High Line. The mock-up does not, in fact, give a very clear impression of what the building will be like.